The Low Down: What if you got to relive your past? Learning to play the cello, meeting your boyfriend for the first time, being with your best friend? What if you got to watch your mother’s strength, your dad’s energy, your little brother’s unconditional love? How about if you get to hear what your family, friends and acquaintances have to say about you? What if this can only happen because you are in a coma? Mia’s family has been in a horrific car accident. What’s strange is while walking the scene, she discovers her own body, lying there. Soon she is en route to the hospital, and over the next day she realizes that no matter how much her friends and family want her to stay, the final decision is up to her. To Read or Not To Read: If you like heart-tugging sadness, overwhelming love and great people, then what are you waiting for? 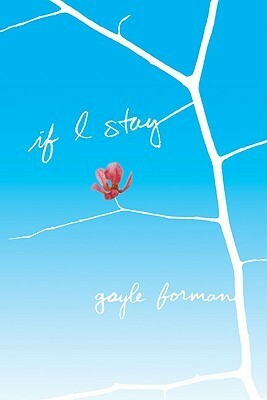 If I Stay by Gayle Forman was published April 2, 2009 by Dutton Juvenile. OMG you gave it a tissue rating, eep. This sounds really good, and I like the premises..how she can hear others. I really have to be in the mood for tissues required reads..adding to my list. I know! I just got the second one from the library, and I am dying to read it – at the right time! Don’t want to have red eyes when I am out and about! Absolutely! Let me know what you think. I will be starting the second one soon.